Barclay’s got fined $445 mln.US $ for putting it’s finger on the scale of LIBOR. Interbank offered rates are over-the-counter (OTC) and consequently are not conducted in broad daylight. Normally there is a neutral observer, usually one of the larger intermediaries ( like Telerate, Reuters, Prebon whatever) that keeps score all day long. Most often there is no closing price. In other cases, such as with FX rates a formal session called a fixing is held at a designated time and place, during which, over a very short period of time, the major parties get an opportunity to behave like animals and rig the system as much as possible in their advantage. In equity markets, that do operate on an exchange, all manner of manipulations are common and accepted as inevitable unless they become overwhelming by their sheer size. 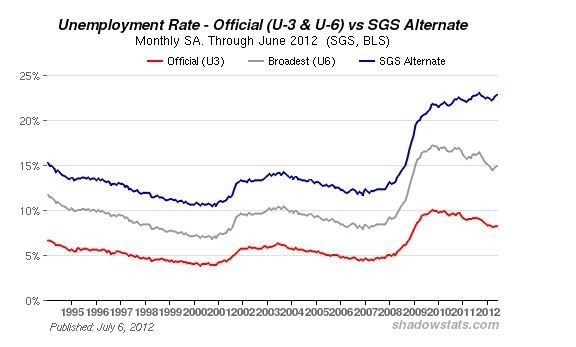 The unemployment rate in the States is running at about 23% if you account for it the old-fashioned way. Looks a little like Spain and is double that of the Eurozone. 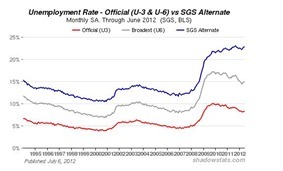 Understating unemployment lowers what is paid out in insurance as that is often a function of the overall rate, and puts the populace in a better mood. The difference between 8.2 and 23 % is pretty large. CPI is another important statistic as it determines what is paid under numerous social programs. Remember back in the late 70ties when inflation was running at 13%, there were COLAs everywhere and Volcker was the white night riding to the rescue. 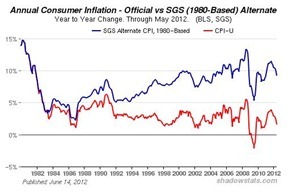 Notice that in 2008 we were not far from that situation and presently the CPI is at about 9% not 2%. The main difference then and now is comprised of a few changes in the computation. Substitution, if you were accustomed to eat caviar with breakfast but now have to settle for kippers because you cannot afford the 5000% increase in price, we just continue to use herring prices instead. Housing, rather than buying a house you are assumed to be renting your own house. During the run-up in by more than 100% from 2000 to 2006, rents actually dropped so CPI went down. Expect them to change this soon. The hedonistic approach, your Atari used to have 1000 of those things, your new computer has 10 terabytes and consequently, since the price has gone down from $2000 to $1000 but the power up by 1000x your new computer only costs $1 on an adjusted basis. Interest rates are presently running at about –7/8%, no wonder investors are crying foul but no indignation from the politicians or even most of the press.